If you are looking for an amazing gift you cannot find in the shops, then look no further!!! You just select the butterflies you like (suggest any number between 1 & 15 maximum) and have them put in a a special picture frame for displaying on your wall. If you want just the butterflies that are native to your area, then once I know where you live I can put together a special selection for you, if you would like name labels inside the collection you just need to let me know upon purchasing. Please have a good look at all the examples below "everything that is sold is subject to the Natural England licensing laws"
"custom picture frame - 18 specimens"
For a larger close up picture, just click on the image to the right, you're looking at a "one of kind" picture frame that was custom designed by Paul Martin. 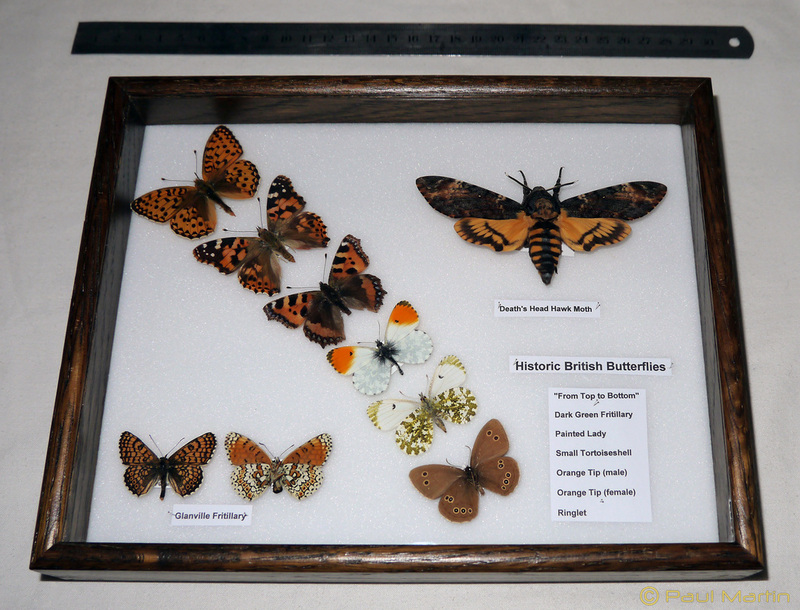 It is simple to design, your own similar picture frame all you need to do is visit my high resolution British butterfly picture page, look through the 58 different species and email me with a list of names and I will put something together for you. I will then send you a preview picture like the one on the right for your approval and suggested alterations before I post out. 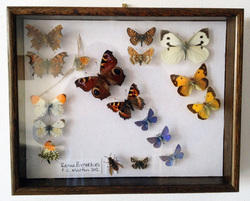 If you prefer me to make you something special and cannot decide which butterflies, then just choose a few you really like and then tell me a total amount of specimens (suggest any number between 1 & 15 maximum) then I will get back to you with some ideas and final price before you buy. "picture frame - selection based on location"
This picture frame was custom designed by Paul Martin based on a selection of butterflies native to the area the customer lives in. For a high resolution close up picture, just click on the image to the right. All butterflies and moths in this frame are not labelled, please request with or without labels when choosing your butterfly selection. Take a look at the large picture below, it shows the picture frame displayed in the customers home. 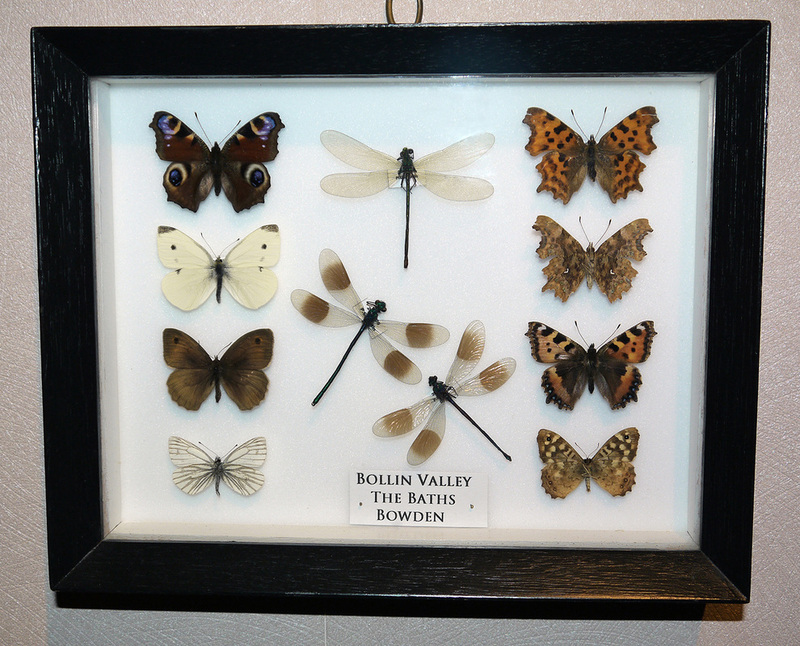 This picture frame was custom designed by Paul Martin based on a selection of butterflies chosen by a customer. 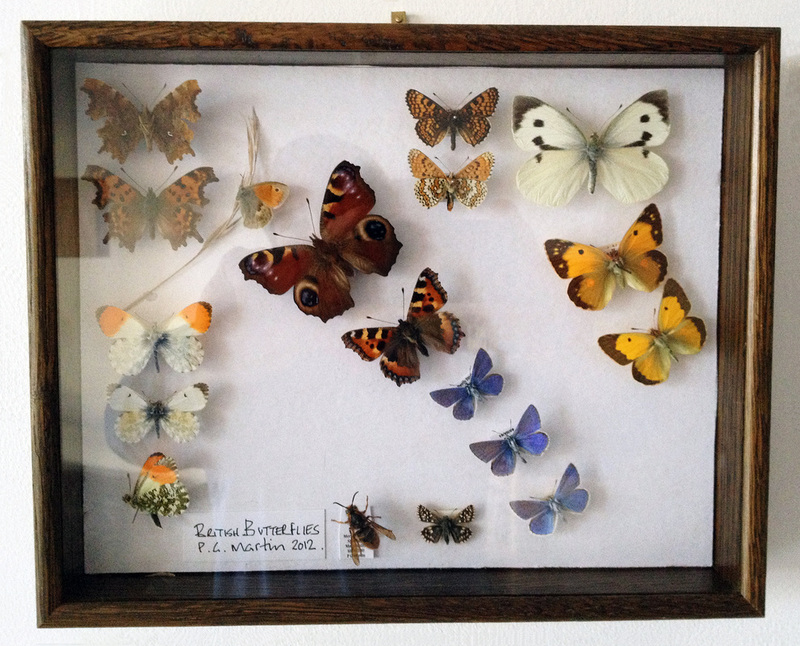 All butterflies and moths in this frame are labelled, please request with or without labels when choosing your butterfly selection.